Our outings are restricted to NNS members. Guests of members can purchase membership for a day for $1. Sunday 6 May: Grasslands Interpretive Site at Lundbom Common. Birding and wildflowers. Meet 9:45 at the Merritt Civic Centre to car-pool or at 10 AM at the Grasslands Interpretation Site off the Okanagan Connector at the top of Hamilton Hill. Easy walking but if anyone is feeling energetic they can end up with a hike up Sugarloaf later in the afternoon. Bring lunch and warm clothes (in case it is windy). Visit by the Biolinx Environmental Research frog experts. Details to come. Contact the amphibian volunteer coordinator Andrea Lawrence (nicola.amphibians@gmail.com) if you are interested in frogging this spring. Monday 14 May: Douglas Lake Plateau grasslands. IBA site visit with Krista Englund, the BC coordinator for Important Bird Areas (IBAs) and other IBA monitors from Kamloops and the Okanagan. All welcome. Mostly a car trip but might involve some short easy walks. Meet at 8 AM at the Civic Centre to carpool. Bring snacks, drinks and binoculars. The plan is to do a loop with some side trips: up Hwy 5A to Quilchena; up Pennask Lake Road to Minnie Lake; north to Douglas Lake with a side trip past Douglas Lake; backtrack a bit to return to Hwy 5A via Douglas Lake Rd; side trip up 5A to Beaver Ranch Flats; return to Quilchena Hotel for a late lunch. (This will be followed by a meeting with the IBA monitors to discuss how NNS can best help to monitor this grassland IBA; NNS members welcome to remain for this discussion too). Saturday 26 May: Harmon Lake Interpretive Forest and wiener roast. Visit this link to see photos and a report on this outing. Birding and wildflowers. Meet 9:30 at the Civic Centre to car-pool or at 10 AM at Harmon Lake on Kane Valley Road. Folks should proceed directly to the trail head parking lot. Drive into the Harmon Lake East Recreation Site, turn left at the boat launch and follow the signs to the parking lot at the north end of the lake. We can assemble there. Should only take about 2 hours to walk the entire trail with some time on top to discuss things at some of the kiosk stations etc. Folks should have good running shoes or light hikers and dress appropriate for the weather of course. It may be a little wet in places but that is hiking! Also have folks take their birding/frog gear in the event we see some critters out there. I will have firewood at the ready at the fire pit by the amphitheatre so the wiener roast can happen after the hike. There is a covered shelter there to huddle under in the event of rain. The trail is 2.3 km in length with only a few short steep sections so it is easy to moderate in hiking difficulty. Lots of opportunities to stop and rest. The NNS will provide the wieners, buns and drinks. Visit by the Biolinx Environmental Research frog experts. Details to come. Contact the amphibian volunteer coordinator Andrea Lawrence (250-378-2468) if you are interested in frogging this spring. Saturday 9 June: Tunkwa & Leighton Lakes. This outing has been postponed – just too cold and wet!! 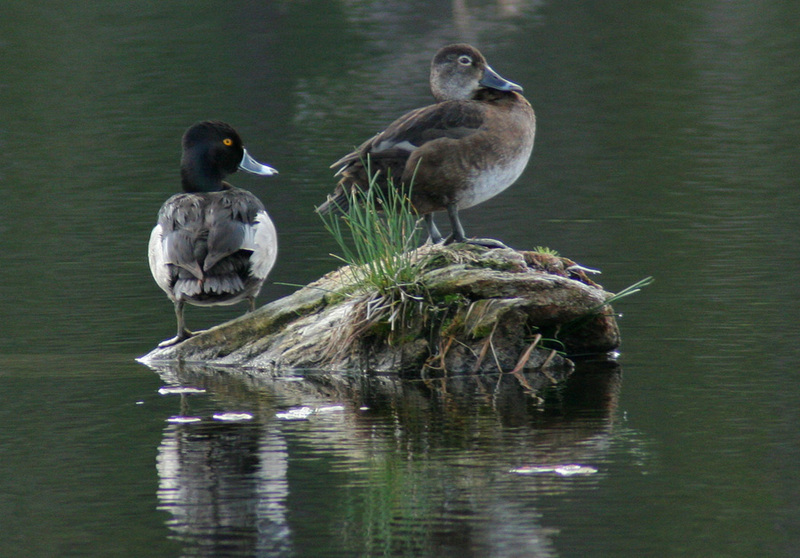 Waterfowl, wildflowers and more. Jack and Carol Madryga are coordinating this. We might move this to an earlier date to make the most of the spring flowers and bird breeding at this scenic area. Details to come. Visit by the Biolinx Environmental Research frog experts. Details to come. Sunday 24 June: Another opportunity to visit the Douglas Lake Plateau grasslands. Meet at 8 AM at the Civic Centre to carpool. Bring lunch and binoculars.